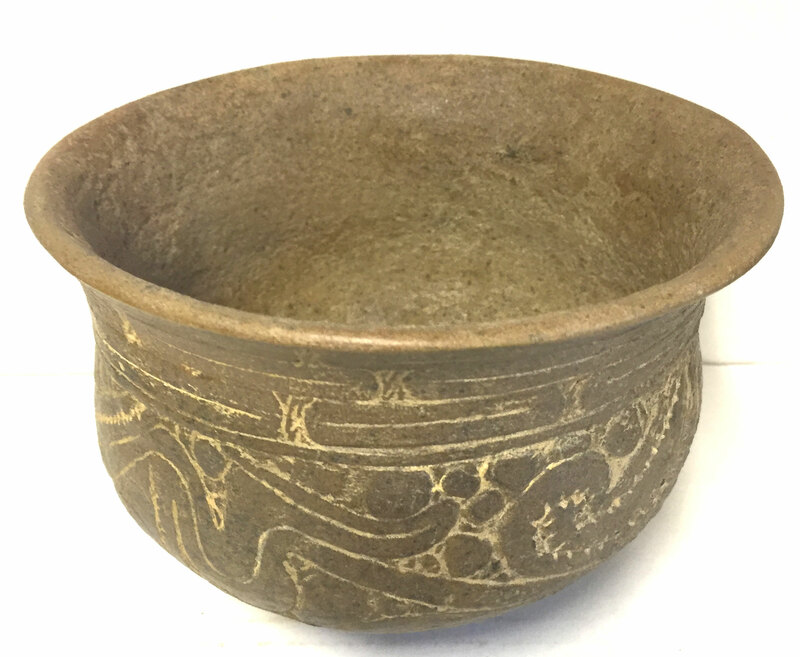 A Medium Size, Visibly Aged, Very Nicely Decorated, Caddoan Natchitoches Engraved Bowl That Exhibits Visible Surface Aging And Clay Coloration Patination, Correct Bottom Aged Use Wear, Visible Inside Bowl Aging And Deposits, Correct Motif And Shape Vessel For The Type, Aged Deposits In The Engraving, Correct Material And Manufacture For The Area Found. Ex-Jerry Carter Collection. The Natchitoches Engraving Is Somewhat Similar To The Hodges Engraving Found Northward In The Caddoan Ouachita Focus. This Very Nicely Engraved Example Was Found Broken And Has Restoration. Includes A Ken Partain Certificate Of Authenticity.